Named By: Michael P. Taylor, Matthew J. Wedel & Richard L. Cifelli - 2011. 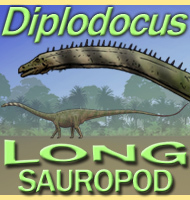 Classification: Chordata, Reptilia, Dinosauria, Saurischia, Sauropoda, Macronaria, Camarasauromorpha. 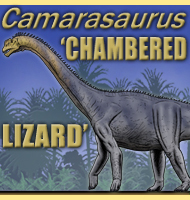 Size: Approximately 14 meters long. Known locations: USA, Utah, Cedar Mountain Formation. 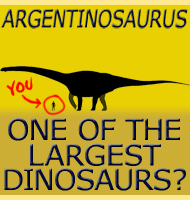 Time period: Aptian to Albian of the Cretaceous. Fossil representation: Two fragmentary specimens, representing two animals of different ages. 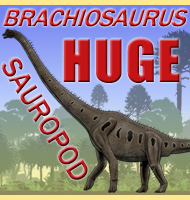 Brontomerus has been given its name for good reason, it had possibly the largest thigh muscles of all the known sauropods. This has been established from the proportionately large ilium that also projects forward. The ilium is where the thigh muscles attach and this enlargement not only suggests enlarged muscles but a degree of strong forward motion, possibly even being able to deliver a kick. One theory, and easily the most popular since its description was published, is that these powerful legs were used to fight back against predators like Deinonychus that would have been common during the time of that location. Such a kick might have also been used in dominance contests where two males might stand side to side and kick each other until one concedes defeat for mating rights over the herd. A second is that it was an evolutionary adaptation for walking up and down slopes in hilly environments. 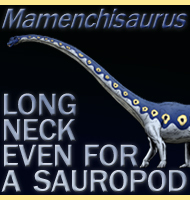 As Brontomerus went up steep inclines it would inevitably have to go down them, and a thigh that provided strong support either way would give it a significant advantage over its other sauropod relatives. The ilium also has attachments for abductor muscles which allow a leg to draw away from the body. These muscles may have allowed Brontomerus to steady itself as it reared up on its legs to reach up and feed on higher vegetation in a tree canopy. All of the above theories are good, and more than one could be correct. 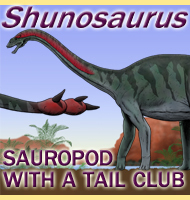 Although given the specialisation in the hip of Brontomerus which does not appear in other sauropods, it could be more likely that it developed to deal with environmental factors of the location, and any other secondary usages a result of this specialisation. 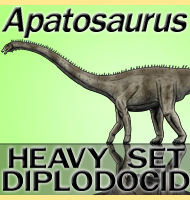 Unfortunately the dig team that discovered and named Brontomerus were not the first to the dig site, and not only were many specimens removed, others lay around broken. Only partial remains of the two individuals have been recovered and between them, the legs are still unknown. 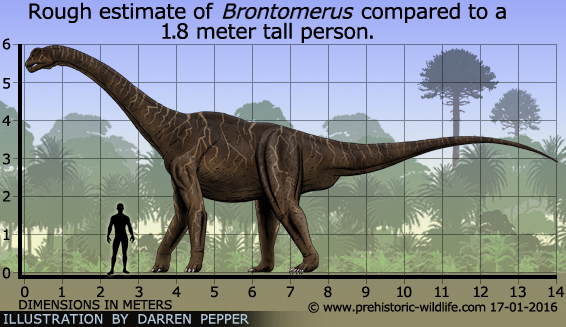 Without further fossil finds, the exact function of the powerful thigh muscles of Brontomerus can only remain as theory. - Brontomerus mcintoshi, a new sauropod dinosaur from the Lower Cretaceous Cedar Mountain Formation, Utah, USA - Michael P. Taylor, Mathew J. Wedel & Richard L. Cifelli - 2011. 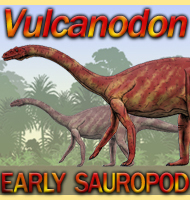 - The early evolution of titanosauriform sauropod dinosaurs - M. D. D'Emic - 2012.